Kids Reading to Succeed: KRS Kids Had a Blast with "Read a Recipe, Learn to Cook" Program in November! 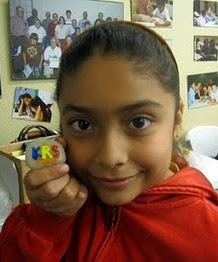 KRS Kids Had a Blast with "Read a Recipe, Learn to Cook" Program in November! With Caitlin's help, KRS students read and discussed a recipe for molasses cookies; and with their volunteers, they then proceeded to make the cookies. Not only did the kids (and volunteers) have a blast, but the program was particularly great in conveying the importance of reading, analysis, and comprehension in a practical, real-world setting. While the cookies were baking in the oven, the kids embarked upon a reading hour with their volunteers. And at the end of the program, they got to bring some delicious cookies home to share with their family and friends! For Caitlin's wonderful (and amazingly simple) molasses recipe, go here. You won't regret it -- the smell of these delicacies wafting through your home as they are baking is simply lovely and just perfect for the fall season. Thanks also to Julie Tsuchiya for donating breakfast for the November program, and to the Lucky 13 Group (led by Julie To) for bringing a great group of volunteers.